In today's Gospel, John uses three words from Jesus' native language and immediately gives a translation of each. To understand why he did this, I offer a comparison based on my experience as a missionary in Peru. During my seven years in that country, I worked among the Aymara Indians. Explaining their practices to outsiders often required the use of words from the native language. For example, every community had men call yatiri. On Sundays, some yatiri would sit on the ground near the parish church. In front of them, they would place a small cloth with a crucifix and other symbols. A young person might sit down opposite a yatiri who would listen, give advice and pray for him. Yatiri literally means “one who prays,” but as you can see, it refers to a more complex role. Similarly, to designate complex realities, John uses three words from the native language of Jesus: Rabbi, Messiah and Cephas. The first two words have passed into English. We are familiar with them, but our familiarity masks a lack of appreciation for their significance. * Still we do know they express something of the identity of Jesus – that he is the long awaited Teacher and Anointed one. The third term we know in its Greek form because it has become a common name - Peter. We are used to the name, but originally it must have provoked surprise, even amusement. Imagine a young mom cradling a baby in her arms and you ask her the name. She replies, “Oh, we decided to call him ‘cement.’” If the parents otherwise seemed normal, you would probably inquire why they chose such a name. But the new name had much more than a personal significance. When St. Paul summarizes the faith, he states that Jesus rose from the dead and “appeared to Cephas and then to the Twelve.” (I Cor 15:5) Writing to Greeks, over a thousand kilometers from Palestine, he uses the Aramaic version of Peter’s name. Also, in defending the authenticity of his teaching to the Galatians, he tells them that he spent fifteen days with Cephas. (Gal 1:18) Now, the Galatians lived in what is today northern Turkey and they had a language different from either Greek or Aramaic. Unless the name Cephas had some mystical significance, why would Paul use it in writing to them? Like St. Paul and his converts, if we are to understand Peter’s mission, we must grapple with what his name (or nickname) meant in its original context. Among the disciples of the great Teacher and Anointed One, he has a unique role - essential in the foundation of the early Church. To make a small pun, he was the “touchstone” of correct doctrine regarding Jesus. 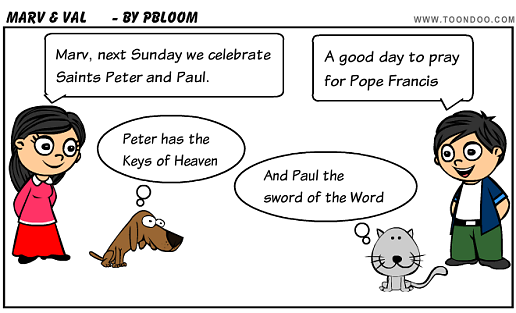 Until the middle of the last millennium, Christians generally acknowledged the office of Peter. ** However, in 1519 an Augustinian monk launched a movement which brought results he never intended. Although Martin Luther may have had good intentions in promoting individual interpretation (“Bible Only”), it has resulted in endless divisions. While we each need to interiorize God's Word, we also need to be guided - and governed. For that reason, when Jesus chose his disciples, he selected one and gave him a new name: Cephas. As we begin a new millennium, one of our great challenges is to renew our appreciation of the Petrine ministry. *I once had a conversation with a guy who was trying to explain to me the feelings of Southerners. He went on about the "carpetbaggers" and told me that we Northerners would feel the same if they came among us. My head was spinning and I finally asked him, "What is a carpetbagger?" He stopped, thought hard, then admited, "I really don't know. I just assumed the word." Something like that can happen to us regarding familiar New Testament words. **Although the Orthodox broke with the Catholic Church in 1054, they would still acknowledge the pope as successor of Peter and even as "first among equals." The debate sometimes centered on whether to emphasize "first" or "equals." Did Jesus Found the Church?